More than 30,000 Stop & Shop supermarket workers across three states remained on strike for a third day on Saturday, protesting what they said were unfair wages and high health insurance premiums. 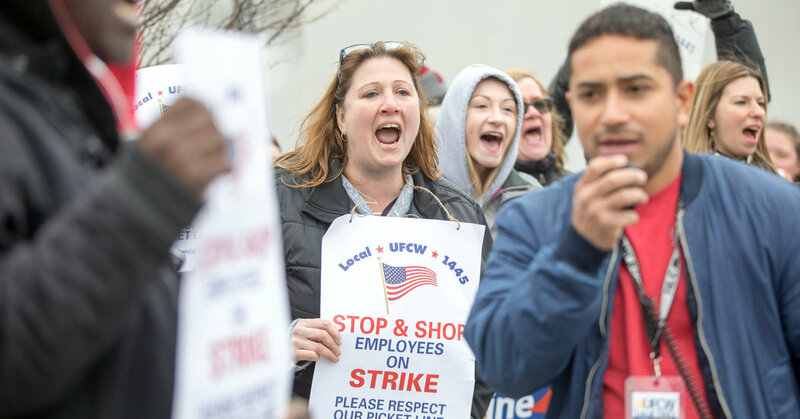 The strike, by United Food and Commercial Workers International Union members working at more than 240 Stop & Shops in Connecticut, Massachusetts and Rhode Island, forced some stores to close. Union and supermarket officials could not say precisely how many. The supermarket activated a contingency plan that included sending support-office staff members and temporary replacement workers to select locations, according to a Stop & Shop spokeswoman, Jennifer Brogan. Pharmacies and banks remained open, regardless of a store’s status, she said. Among the workers on strike were cashiers, stockers, bakers, deli clerks and butchers. A previous three-year contract expired on Feb. 23. Last year, while employees were seeking better wages, Stop & Shop’s parent company, Ahold Delhaize, reported profits of more than $2 billion to its shareholders, according to Erikka Knuti, a union spokeswoman. Most full-time employees, including unionized department managers, earn an average of $21.30 an hour, Ms. Brogan said. Stop & Shop said its latest proposed contract included, among other things, pay increases for all associates, no changes to employees’ deductibles, an increase of $2 to $4 on health insurance premiums and an increase to the company’s pension fund contributions. The president of Stop & Shop, Mark McGowan, said in a statement on Saturday that the contract the union had proposed was “unsustainable” and could lead to higher prices for consumers. Thomas Kochan, a director of the M.I.T. Sloan Institute for Work and Employment Research, which focuses on addressing the needs of a modernizing work force, said Stop & Shop didn’t have to raise prices to provide higher wages. The way the strike was unfolding was par for the course, he said. “They are unionized and an older company that doesn’t have as strong a reputation for great customer service,” he said, adding that the supermarket chain has to remain competitive to provide higher wages. At a Stop & Shop on Main Street in Bridgeport, Conn., Lisa Juliano, a florist manager who has worked at the store for two years, said she was particularly worried about the loss of premium pay for working on Sundays. Though she said the company wasn’t directly proposing a reduction in the Sunday pay for current employees, it does want to eliminate the premium for new hires. Many employees expect those new employees would then be asked to work most Sundays, resulting in a de facto pay cut for the more tenured workers. She said it was important for current workers to fight for the benefits of future ones. Her father was hired by Stop & Shop more than 30 years ago, to push shopping carts, and he is now a grocery manager, she said.